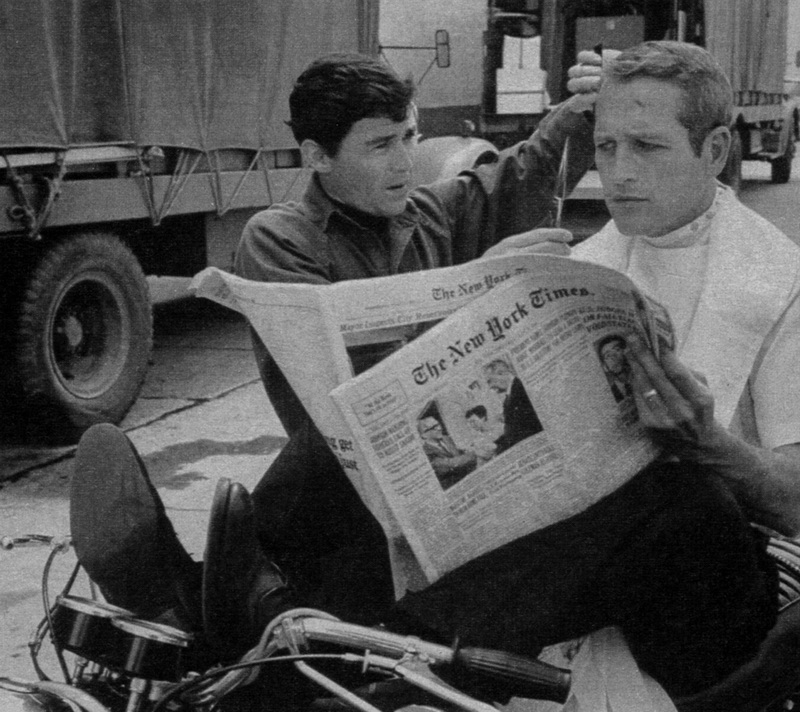 A cut above: Jay Sebring, who invented a new way of styling men’s hair, with Paul Newman on the “Harper” set in 1965. Fall 2002 – I have interviewed many celebrity hairstylists in my day, but this would be my first dead one. I figured it would be challenging but not impossible, since the initial contact had come from him — or at least, from his products, which had come to me through an intermediary: black packages with red lettering. I held the shampoo like a talisman, noting the cross surmounted by a circle, the Egyptian ankh, sacred symbol of life. Up until Aug. 9, 1969, the name beneath the ankh had stood for Jay Sebring, the No. 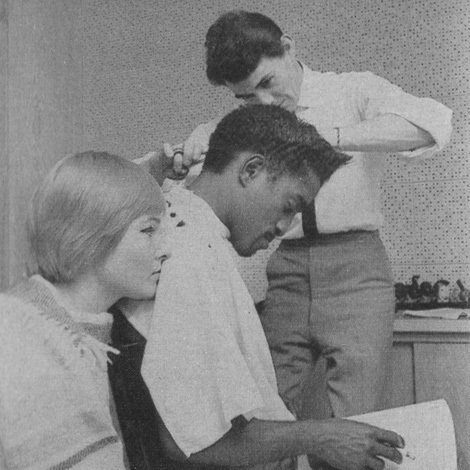 1 haircutter to the stars, the guy who came out of beauty school and invented a whole new way of cutting men’s hair. Who went into a white-coated profession dressed in hip-hugger jeans and chambray shirts. Who studied martial arts with Bruce Lee and raced sports cars with Paul Newman. Before Aug. 9, 1969, it was a name known only in select circles; afterward it was known everywhere, as the name of the man who was butchered with Sharon Tate and three others in the notorious Manson murders. Now, here was the name again, on a bottle of shampoo, where it had been leading a parallel existence for more than 30 years. To look at it, you would not have known that the events of that heinous night had ever occurred. I felt like Jay Sebring was calling me on a mission: to restore the name to the man, to devictimize the victim. It didn’t take the deductive powers of a Philip Marlowe to call the toll-free number on the side of the package. Right away I got lucky. Nancy Papin, executive vice president of Sebring Products, answered the phone. Her husband, Robert, had been distributing the products for two years before Sebring died. They now own the company. The products go to about 2,500 shops across the United States. Not only that, there is a certified Sebring method that is still being taught and followed. Nancy gave me a number in Houston. Mike Guessfeld picked up. He had the soft voice of a well-raised Southern boy, and didn’t stint on the “Yes, ma’am”‘s and “No, ma’am”‘s. Guided by the phantom hand of Sebring, he has been cutting hair for over 30 years. He learned the Sebring method from the two hottest barbers in New Orleans, who had once sought out Steve McQueen on location, hoping to cut his hair and establish their reputations. But when they saw McQueen, it was clear that he didn’t need a haircut. In fact, they were so blown away by how good his hair looked that they went to Los Angeles to meet the man who cut it. They learned the technique and opened a Jay Sebring franchise in the Big Easy. One of my favorite Web sites — www.findagrave.com — listed Jay Sebring, born Oct. 10, 1933, and revealed a simple headstone in Holy Sepulchre Cemetery, Southfield, Mich., for Thomas J. Kummer. The accompanying head shot could have been that of a movie star, a three-quarter profile with half the face in shadow. The expression was thoughtful, even moody. The hair was impeccable. The man who had renamed himself after an auto race in Florida, who had scored big in Hollywood, had been carried back to where he started. I was not certain he would be pleased. It had been years since I’d been to the City of Angels. Because Sebring had driven a Mustang Cobra, I thought I should, too, but Hertz could offer only a Toyota Camry, so I took it and immediately drove to Benedict Canyon, to what had become known as the Sharon Tate house, although she and her husband, Roman Polanski, were renting it at the time she died. The low, rambling ranch house was gone, replaced by one of those mutant behemoths that seem to be spreading across the country. Farther up the canyon, I turned on Easton, looking for Sebring’s Tudor, once owned by Jean Harlow. It had the head of John Barrymore carved into the rafters, secret ways to get out of the house in a hurry sprinklers over the windows to make it look as if it were raining outside. Sebring, with the actress Sharon Tate, in a photograph from the Sebring family album from the mide-1960’s. Is it the manner of Sebring’s death that casts a Gothic shadow over his life, or was it always there? I longed to see the half-timbered house but was foiled once again. I stopped the car and looked up to where the house should have been. The California sun blinded and confused. The vegetation obscured. Frustrated, I turned back to Beverly Hills and the salon of Joe Torrenueva at Camden and Wilshire. Torrenueva, half Puerto Rican and half Filipino, showed me his scrapbook with photos of Sebring and the celebrities, many of whom now come to Torrenueva. He’s small, with a complexion as clear and fine as a baby’s, short dark hair just touched with silver. I felt that if he were cutting my hair and looking into the mirror instead of my eyes, the words would flow; instead they stumbled and halted. In the pauses and non sequiturs, I sensed the restlessness, the discontent, that haunted Sebring. Torrenueva — married since 19, a father and grandfather — seemed to be still puzzling over Sebring’s state of mind. The handshake from this soft-spoken man was a surprise but made sense. The power was in his hands. A block away, on Rodeo Drive, I headed into DBL Realtors. (When pursuing the deceased, it pays to play the hunches.) I described my mission to the young receptionist. Would anyone there know what happened to the Tate house? The receptionist suppressed a smile. There was someone who worked there but was out; she claims she rented the house to Sharon Tate. I left the number of my hotel. 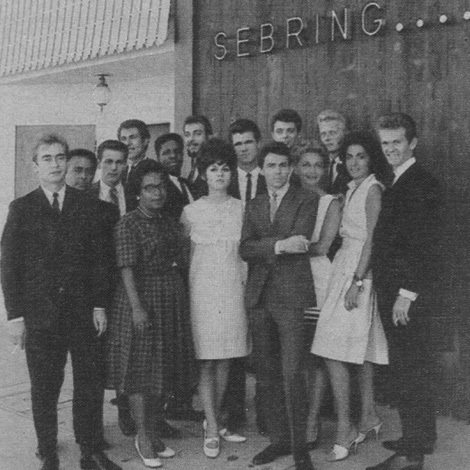 Sebring, arms crossed, with employees of his West Hollywood salon. Far from the madding crowd. 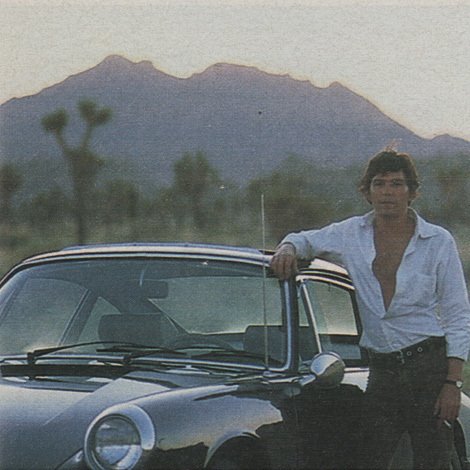 Jay Sebring with his Porsche in Joshua Tree National Park in July 1968. 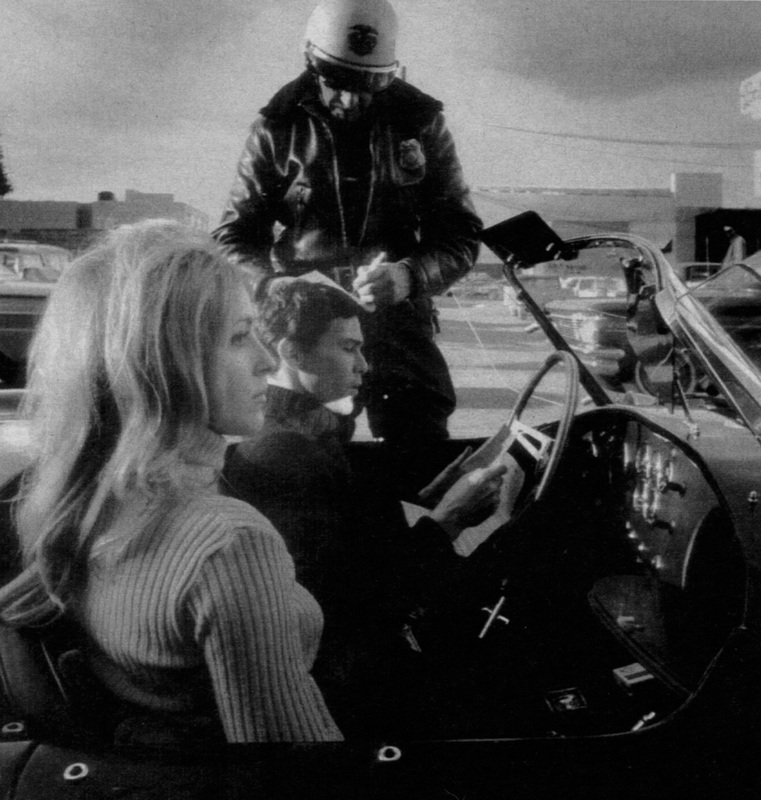 Sammy Davis Jr., with his wife May Britt, gets the Sebring touch in 1962. Back at the hotel there was a message from a realtor, Elaine Young, and three numbers. I called, and she gave me a private number to call her back. She was clearly rattled that I found her by just walking in off the street. “I was his best friend!” she exclaimed. She was married to Gig Young and used to go with him when he had his hair cut, to gossip and see the stars. Polanski never returned to the house in the canyon. The owner of the house moved in and stayed for years. “He said the house had good vibes.” It sold not long ago to a developer who tore it down to build an 18,000-square-foot house that just sold for about $8 million.